Mini chocolate chips melt together and pair perfectly with nutty almond butter in these Must-Make Chocolate Chip Almond Butter Bars. Made with coconut oil, oats and honey, these bars come together quickly and disappear even faster once you take them out of the oven. Thank you to ALDI for sponsoring this post! To find an ALDI near you check out their store locator here! There is something about baking that relaxes me and makes me happy. 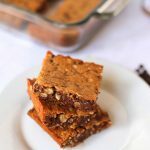 As I measure the ingredients and mix everything together, I get that familiar feeling of comfort that seems to surface every time I lick beaters full of oatmeal cookie dough or bite into warm brownie fresh out of the oven. I bought everything I needed for these bars and our cookout at ALDI, including all of the ingredients for the Black Bean and Brown Rice Salad we all loved so much! I initially thought I’d make a simple batch of chocolate chip cookies for dessert for the cookout but when I saw the SimplyNature Creamy Almond Butter (part of ALDI’s SimplyNature line of product that are free of any artificial preservatives, flavorings and colors) for only $4.99*, I switched my game plan and picked up some oats, SimplyNature Organic Coconut Oil, mini chocolate chips and SimplyNature Organic Wildflower Honey with the hope of making a batch of chocolate chip almond butter bars for everyone to enjoy. Chase has also been loving homemade energy bites made with dates and an assortment of nuts and nut butters, so I grabbed some dates and walnuts as well, figuring I could make a toddler-friendly energy bite version of the bars for him, too! 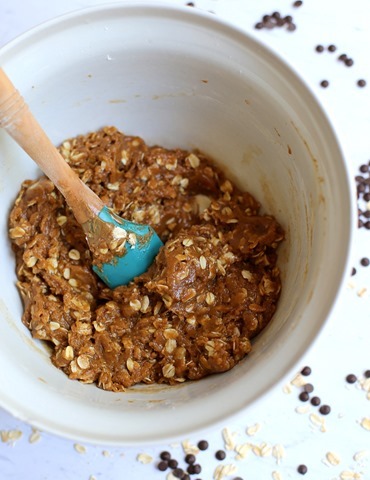 The bars were really easy to make – a one bowl recipe – and everyone loved them! As you’ll see below, the recipe calls for mini chocolate chips and while regular chocolate chips may be substituted, I definitely recommend sticking with the mini chips because they melt into the bars and make them extra chocolaty and almost brownie-like. 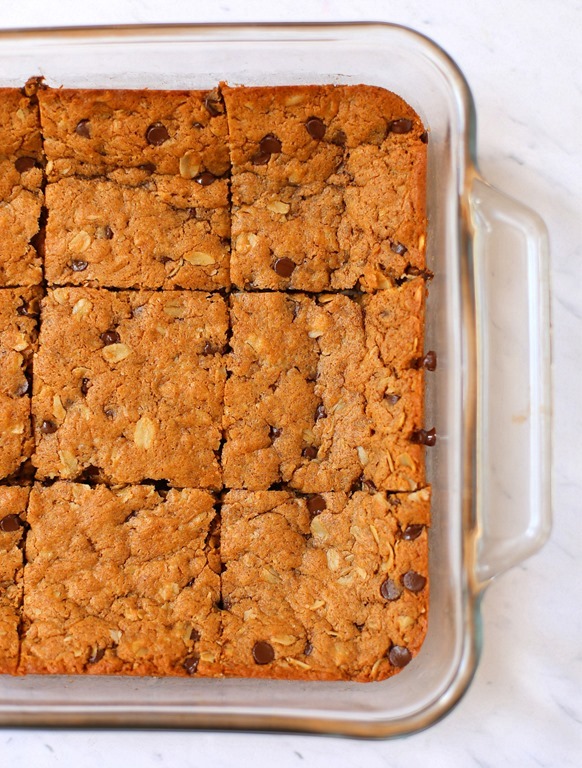 These bars taste like a perfect hybrid between a chocolate chip cookie and an almond butter blondie. Mini chocolate chips melt together and pair perfectly with nutty almond butter in these Must-Make Chocolate Chip Almond Butter Bars. Made with coconut oil, oats and honey, these bars come together quickly and disappear even faster once you take them out of the oven. Mix almond butter, brown sugar, vanilla, honey, melted coconut oil and egg together in a large bowl until combined. Slowly mix in the flour, oats, baking soda and salt. Once batter is fully combined, stir in mini chocolate chips and spread batter into an 8×8 baking dish sprayed with cooking spray. Bake for approximately 20-25 minutes or until top is lightly browned. Allow bars to cool and then transfer to the refrigerator for about 30 minutes or so before serving to allow the bars to set further. Combine dates, walnuts and almond butter in a food processor and pulse until a thick dough forms. Remove food processor blades and stir in mini chocolate chips. Roll batter into round balls and refrigerate for an hour before digging in. Store in an air-tight container. Disclaimer: Price and product availability may vary store-to-store. 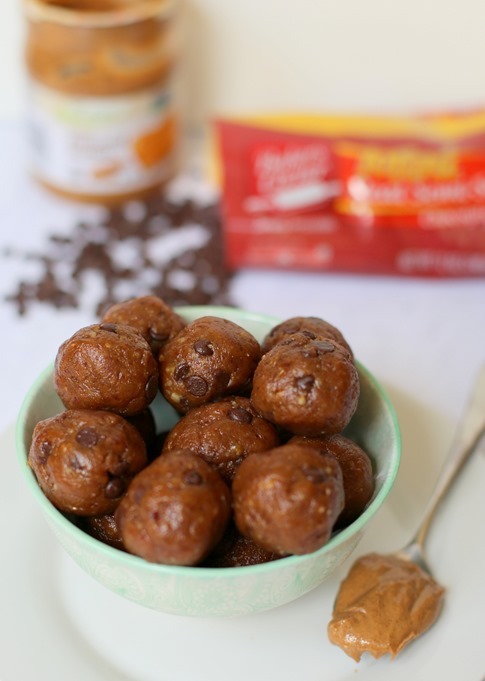 I love that these would be an awesome dessert but have some healthy staying power in them! Coconut oil and almond butter are a match made in healthy fat heaven! We do most of our grocery shopping at Aldi. I love that I can quickly grab all the ingredients for these while I’m there. I’d love more Aldi recipes​! Making these for our Memorial Day trip! Sounds delicious! GOO central! These bars pack some serious goo and I love it. Yessss! The gooey middle was definitely the best part! Both recipes sound so good! Nut butter + chocolate is one of my all time favorite combos. Thanks for sharing these! These look so delicious! I am definitely going to save this recipe to make later. Also, 4.99 for almond butter is an awesome price. 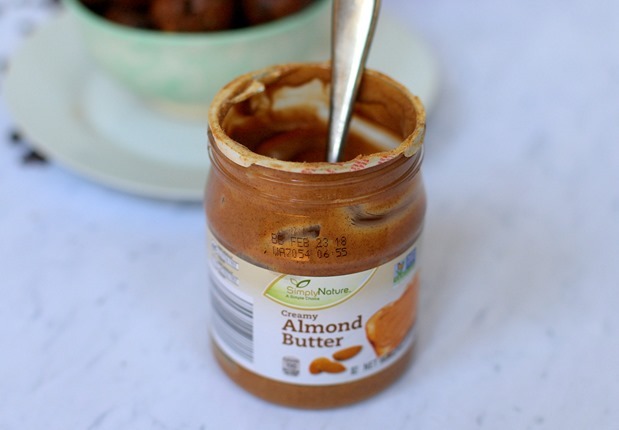 You really can’t go wrong with almond butter! I agree with you, there is something super relaxing about baking and plus, it makes the house smell amazing! So, these are totally healthy right? They look delish! One of the things I’m really looking forward to when we move to TX is being close to an ALDI! I’ve actually never been, only because they literally aren’t here! I think there might be ONE in AR that I know of! These sound great! I feel a little broken if I don’t get my Aldi’ing in on the weekends. 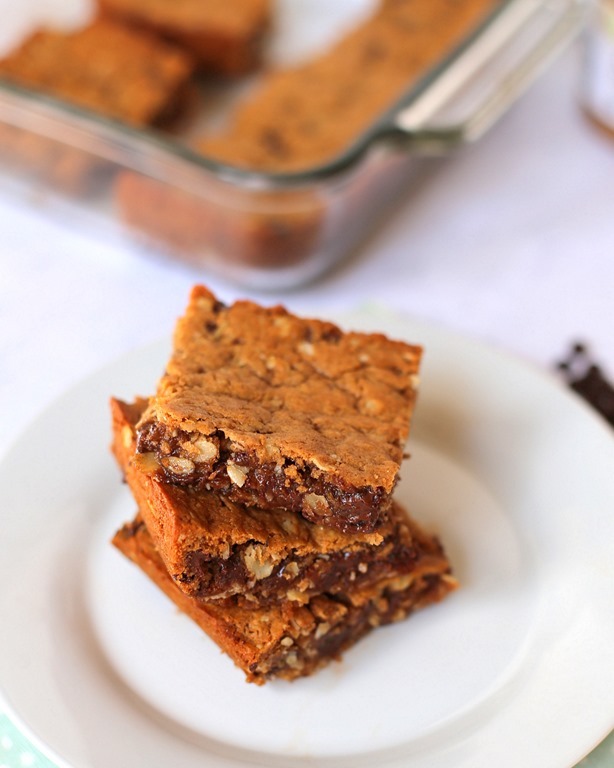 Those almond butter bars look incredible!! Do you think you could substitute the egg with a flax egg? I think you probably could but I cannot say for sure since I haven’t personally tried it yet. If you do, please report back and let me know if it worked!! I wish we had Aldi here, but I shop mostly at Publix (love!) and a local chain, Rouse’s. I already had all of these ingredients and have a friend coming over tonight, so in the oven these go! The batter tasted AMAZING! Hooray!!! Really hope you enjoyed them! Talk about a delicious post! I don’t have kids, but I think I might be making those energy bites this weekend! If they are good enough for Chase – I am sure they will be amazing!!! Ooooooo…these look so yummy! Perfect for what we were craving tonight! Thanks for another great recipe – your recipes are so easy and FAST! Thanks! I’m so obsessed with almond butter I go through like a jar a week. I need to find giant jars, lol. The combo of oats and nut butter always seem to be a win. These look so good! oh bummer! they are refrigerated so check by the produce next time! also, i’m SO glad you liked the bars!!! thank you for taking the time to let me know! Hi Julie, what could you substitute honey with? Maple syrup? I think that should work!! How do you think whole wheat pastry flour would be as a substitute for the all purpose?